Whenever I talk about the ups about a film that I love, sometimes I start with "Where do I begin?". That start is certainly fitting for the appropriately titled Begin Again. 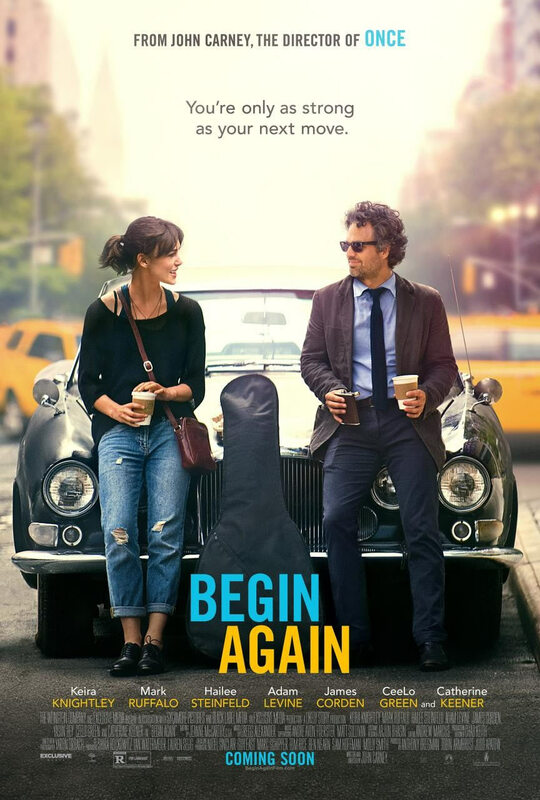 Begin Again follows the story of a record label producer named Dan (Mark Ruffalo) who not only is separated fron his daughter (Hailee Steinfeld) and wife (Catherine Keener), but gets fired from his job. Just as he feels he hit rock bottom with nothing to live for, he stumbles across a woman named Greta (Keira Knightley) who, after singing a song that moves Dan, forms a musical bond with him that will shape their lives. Where do I 'begin'? I'll start off with the harmonious performances. Keira Knightley shines as Greta and manages to pull off a character that is slightly neurotic yet illuminates the screen when she appears as it is so easy to connect with her. Mark Ruffalo is his usual astounding self and manages to not only provide some great comedic timing, but also such raw emotional gravitas through the use of subtle glimpses. Both he and Knightley have such dynamic chemistry and each create such complex characterizations. Next, I'll get into the thematic material. What I found so amazing was how despite it being a film about music, it doesn't necessarily go into the politics of the music industry or anything like that. It is more about the philosophy of why we make music, whether it is to have some kind of connection, to emotionally inspire people, or to follow our hearts. Lastly is the film's most crucial element: The songs. All of them are not only absolutely incredible, but almost each one has a purpose. For example, "A Step You Can't Take Back" inspires Dan to not want to take his own life and leads to the first meeting of him and Greta. Also, the Oscar-nominated "Lost Stars" is a representation of the relationship between Greta and her ex-boyfriend Dave, played by Adam Levine, as well as how Greta struggles to let her artistic integrity be recognized by a large audience. Overall, Begin Again is a wonderful ode to the emotional power of music with fantastic performances from the cast as well as harmonious songs that demonstrate the dynamic storyline. Ab-so-lutely. Even if you haven't seen the film yet, listen to the soundtrack. But I think everybody should see it.